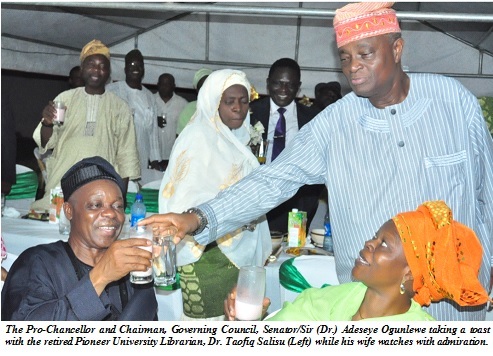 The Governing Council of the Federal University of Agriculture, Abeokuta (FUNAAB) recently organised a farewell reception in honour of the pioneer University Librarian, Dr. Taofiq Salisu, who retired after 22 years of meritorious service to the University. Speaking at the occasion, the Pro-Chancellor and Chairman, Governing Council, Senator/Sir (Dr.) Adeseye Ogunlewe, statedthe occasion was to honour the pioneer University Librarian as “not everyone that commences a career ends up being alive”. Senator Ogunlewe, who was Chairman at the occasion, congratulated the Retiree and members of his family for finishing the race well, while praying that “similar honour would be done to so many of you when you retire”. The Vice-Chancellor, Professor Olusola Oyewole, also showered encomiums on Dr. Salisu describing as a man of wisdom, who also had the fear of God. The Vice-Chancellor said the former University Librarian had a good sense of humour. “No matter how disturbed you are, when you get to him, all your worries would disappear as he would crack one joke to ease it out”, he stated. The National President of the Ijebu-Mushin College Old Students Association, Alhaji Korede Lawal, added that even though, their alma mater was noted for the production of top-flight Engineers, Dr. Salisu came out as an outstanding student of Liberal Arts. His words, “He has impacted a lot. He has been a role model to many young ones and even colleagues and it has never been a dull moment with him”. The University Librarian, Dr. (Mrs.) Mulikat Salaam, thanked the Governing Council and Management for putting a befitting programme for her boss. She described the Pioneer Librarian as a transparent person, whose qualities of punctuality and cleanliness was a model any day. In his response, Dr. Salisu, the former pioneer Librarian, who was also a former Director, University’s Institute of Human Resources Development (INHURD) as well as the Pioneer Head, Office of Advancement, appreciated all for the honour done him by organising the farewell reception. 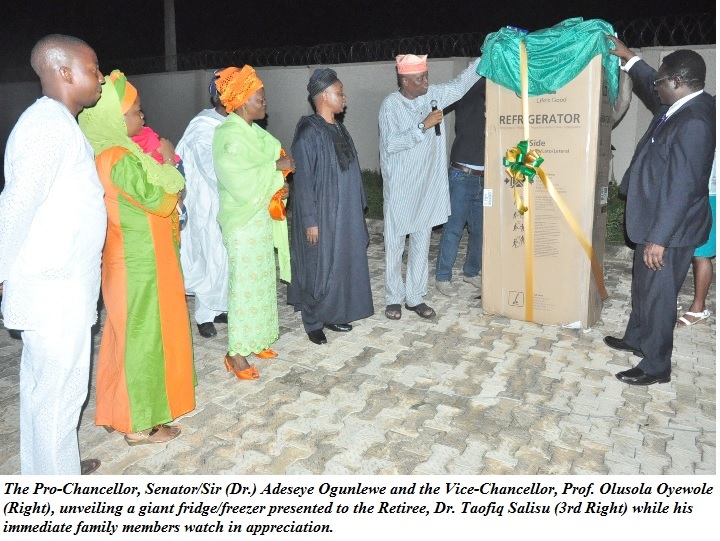 At a similar occasion, Members of the University community, relations and well-wishers also recently joined the staff of the ‘Nimbe Adedipe Library in celebrating the pioneer University Librarian, Dr. Taofiq Salisu, who has retired from the services of the University. 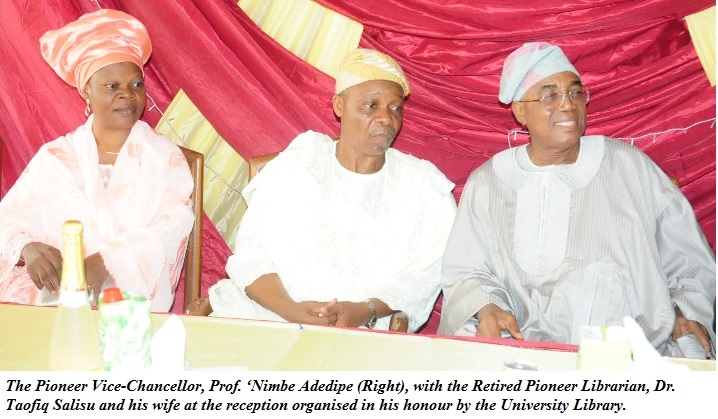 The colourful ceremony which had the pioneer Vice-Chancellor of the University, Professor ‘Nimbe Adedipe as the Chairman, who disclosed that Dr. Salisu was employed during his tenure as Vice-Chancellor, described him as an achiever who was “found useful and was able to stay useful to the University for so long”. According to the pioneer Vice-Chancellor, although Dr. Salisu completed his two terms as the University Librarian, he had served in various capacities in the University and had contributed in no little measure to the development of the University Library; the ‘Nimbe Adedipe Library. He advocated for better funding for the University Library because “the library, for me, is the heart of the Academia and should be well funded”. Professor Adedipe commended the commitment of the incumbent Vice-Chancellor, Professor Olusola Oyewole and his predecessors for upholding the tradition of excellence in which the University was built on. According to him, “laying a foundation is one thing, but maintaining and sustaining it is another thing. I want to thank you for upholding the tradition and still holding unto mantle of excellence”. He prayed that the University would continue to experience development, as he disclosed that he would always be proud of FUNAAB. Earlier, the Vice-Chancellor, who was represented by the Deputy Vice-Chancellor, Development, Professor Felix Salako, appreciated the pioneer Vice-Chancellor for the solid foundation he had laid. “If the foundation had been faulty, the University would have been nowhere and it is not just about structure, but also content development and discipline instilled. Despite the indiscipline in the society, FUNAAB is still holding its head high in that regards”, he added. While congratulating Dr. Salisu on his successful retirement, Professor Oyewole confirmed that even though he is retired, he is not yet tired, as he prayed that God would continue to renew his strength. The Vice-Chancellor said the University would continue to keep in touch with him, to tap from his wealth of experience, as he solicited his continued support for the University’s Office of Advancement. Speaking at the occasion, the University Librarian, Dr. (Mrs.) Mulikat Salaam, noted that “not every leader can retire with such grace, dignity, respect and a teary eyed farewell from the whole office after 13 years of completion of tenure as University Librarian”. She described her former boss, Dr. Salisu, as “a good mentor, a very transparent person, religious, God fearing, a just leader, amiable and very social”, Dr. Salaam said he would be greatly missed and wished him success in his future endeavors. Highlight of the occasion was a lecture titled, Bridging the Gap Between Practice and Teaching of Librarianship in Nigerian Universities, delivered by Professor Iyabo Mabawonku of the Department of Library, Archival and Information Studies, University of Ibadan.Professor Mabawonku enumerated the challenges facing University libraries in Nigeria to include the appointments of non-librarians as Librarians. She suggested that there should be a distinction between job titles and descriptions of those who are Librarians and those who are not. She said those who had worked for at least five years in the libraries and were mature enough to identify problem areas in the practice should be allowed to enroll for PhD programmes. Responding, the pioneer Librarian appreciated the Management of the University for availing him the opportunity to contribute his quota to the development of the University in many aspects and gave the assurance that his doors were always open. Dr. Salisu also specially lauded library staff for honouring him, stating that they would always occupy a special place in his heart.